Since the advent of drones, there has been a constant stream of innovative applications for these flying machines. One of these innovations has been the marriage of this relatively new technology with the age-old practice of fishing. The development of drone fishing is exciting because it creates many entirely new possibilities for anglers. Below, I will discuss methods for drone fishing, how to do it efficiently, and necessary precautions. Direct Drone Fishing – Upon hearing the term “drone fishing,” this may be what many envision; tying a baited line directly to a drone, and hovering/flying the drone around while waiting for a bite. This is quite risky as there is a good chance a fish exceeding the drone’s payload will drag it to a watery end (if it’s not waterproof). Furthermore, fishing with a line affixed to a drone is not permissible under International Fish and Game Association (IFGA) guidelines. However, the method I will describe next is far more efficient, less risky, and, as explained here, is accepted by the IFGA. Drone-assisted Line Delivery – Fishing with drones is most efficient when a drone is used to carry and drop a baited line at great distances. This permits anglers to fish spots that they could not access by casting. This is especially true for those fishing from the shore. Drone-assisted line delivery has distinct advantages over traditional fishing techniques. It can permit scouting for schooling fish from the air and let anglers to drop a baited line directly into a school. Furthermore, it can provide an aerial view of the catch from first strike back to the shore. Finally, drone-casting can allow anglers to target schools of fish that are easily spooked. As fish are accustomed to birds hunting for baitfish at the surface, many will not be frightened by the drone; on the contrary, fish may take this as a cue indicating presence of baitfish and come investigate. This method is best-suited for the ocean or a large lake. While there is not necessarily anything wrong with utilizing a drone to fish from a smaller body of water, such as a pond, the true advantages imparted by a drone come into play on big water. Color: While this may seem arbitrary, color can greatly impact your ability to keep track of your drone. Against a white cloud or blue sky, a like-colored drone may become nearly invisible at a great distance. Water Resistance: I highly recommend using a drone that is waterproof. This feature greatly reduces the risk of total drone loss in the event of an unintentional water landing or if a big fish pulls it down. You will spend a lot more time fishing and less time worrying. Range: The longer the range, the further the drone can carry your line. Battery: A longer battery-life means longer flight-time. When considering battery-life, also keep in mind the additional weight of the baited line will result in a shorter battery life than listed in the specifications. Also, consider a drone with a plug-and-play battery system. This feature will permit you to swap a low battery for a fresh one on the spot. Payload: Make certain the drone can carry the line, hook, and bait. If you intend to do deep-sea fishing, this will require a heavier payload. Live-streaming camera: This feature is necessary for finding schools of fish from the air. Create an Attachment Point. If your drone is not built specifically for fishing, you will need to create an attachment point for a clip/release mechanism. This will need to be centered so that load is equally distributed among the drone’s propellers. 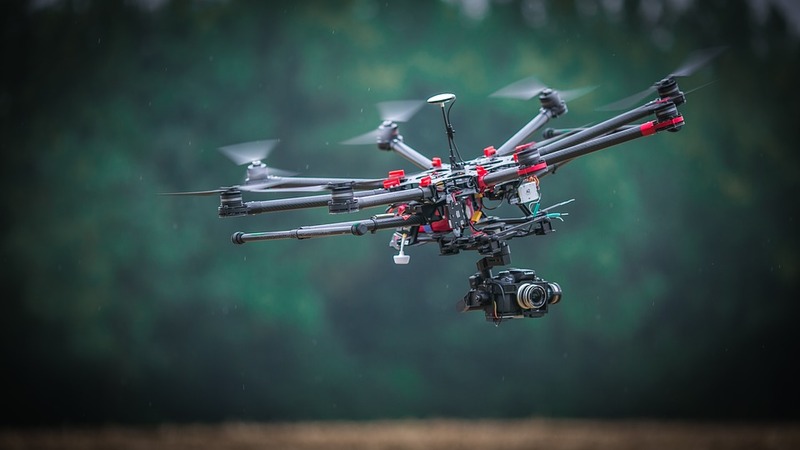 To avoid damage, rig it to load-bearing structures, such as landing gear, and avoid attaching anything to the camera or gimbal. Rig on a Release Mechanism. Next, you need to attach a clip that will securely carry your line, but release at the right time. A downrigger clip is perfect for this task. Then attach your line to the clip. Cast the Line. Unlock your reel and fly the drone to your intended drop sight. If your drone has streaming capabilities, again, you can use it to locate schools of fish near the surface. Once the drone is over the target, lock your reel and, as the drone continues to fly, tension will release the clip and drop the line. Keep Track of Your Drone. Fly your drone back to your location or, if you have streaming capabilities and some help, record the action from the air. Follow the above steps and, as can be seen from these drone fishing videos posted on YouTube, you may have some spectacular results. Follow the above steps and, as can be seen from these videos where drones were used to fish for Tuna and Giant Trevally, you may have some spectacular results. Pay attention to weather conditions. The risks imposed by high winds and rain to a drone over water are clear. Be mindful of your drone’s range. A trip outside of the range of controllability may result in a plop in the water and the loss of your drone. A second line attached to the drone can facilitate retrieval of an out-of-range drone, but it will probably find its way to the water before you get it back. Be mindful of battery life and remember carrying a payload will decrease battery life. The prior statement regarding a secondary attached line applies here as well. Look out for large raptors, such as hawks and eagles. They sometimes attack drones resulting in loss of the drone. Some, such as Bald Eagles, tend to rob other birds of fish in flight, making a bait-carrying drone a prime target for their depredations. When engaging in drone-assisted fishing, knot local, state and federal regulations affecting activities related to flying drones in addition to those governing fishing.